1Add the baking powder, baking soda, salt, eggs and ghee to the flour and mix well. 2Pour water gradually and knead to form a soft dough. 3Add 2 tbsp oil and knead for about 20 minutes. 4Add the remaining 3 tbsp oil and knead, then let stand for about 2 hours. 5Again beat and knead the dough for another 10 minutes. Divide the dough into big lime-sized balls. 6Dust each ball with dry flour and using a rolling pin, roll it into as thin a circle as you can. 7Spread 1 tsp of oil on it. Fold one from one side, first in, then out, until the circle becomes a strip. Beat slowly and stretch it gently. 8Brush some oil in your hands, hold one end and roll the other end making a spiral. 9Brush a little oil on and keep aside for about 30 minutes. Do the same with all the dough balls. 10Heat a shallow frying pan. 11Using the rolling pin, roll out each spiral into thick, flat circles. 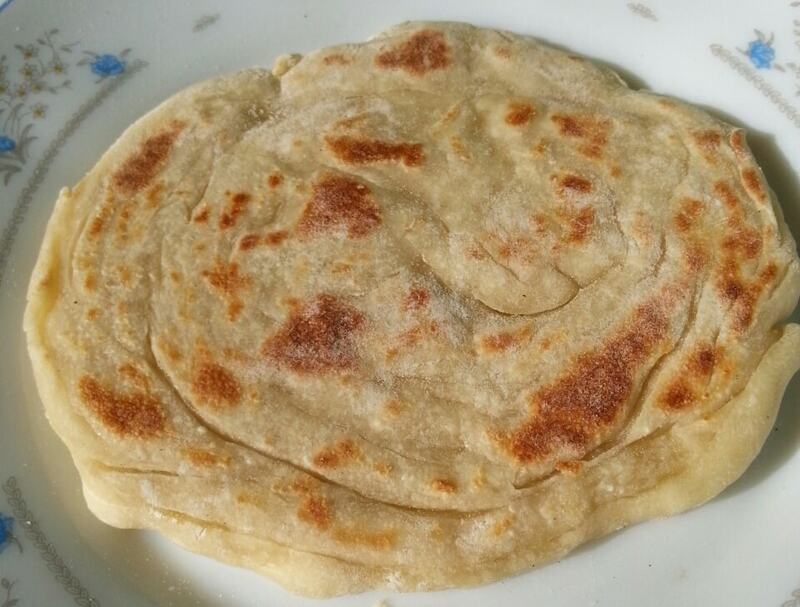 12Spread ½ teaspoon oil in the pan and place one farata dough. 13Cooking over a medium heat, when one side turns a light golden brown, turn over and cook other side with another ½ teaspoon oil. 14Stacked the cooked ones on a plate. Serve warm.